It all began in 1987, when Sister Loretta Rafter of the Humility of Mary Housing Inc., felt called to find a solution to homelessness for single-parent families. 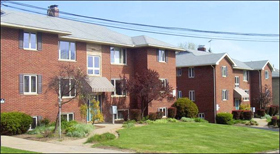 Starting with just 8 units of transitional housing on Copley Road, it has now blossomed into 32 units of transitional housing. Twenty two of the apartments are located in Akron, and the other ten are in Northfield. “The ultimate goal of our program is that individuals attain and maintain permanent housing and do not return to homelessness,” Melissa Massey-Flinn, Program Director of H.M. Life Opportunity Services (HMLOS) said. HMLOS offers affordable housing to homeless, single-parent families for two years, giving them the chance to obtain employment, go to school and get their lives together. “In order to qualify for housing they have to be willing to participate in the program, which is geared towards helping single parents become self-sufficient,” Massey–Flinn said. Individuals must be homeless and 18 years of age or older. “We have a very extensive waiting list. The majority of participants come from homeless shelters; either ACCESS, the Haven of Rest, Interfaith Hospitality Network – it’s mostly word of mouth,” Massey-Flinn said. Rent is based on income. Parents pay 30% of their gross income to HMLOS. If they do not have an income, the minimum rent is fifty dollars. This includes all utilities, and apartments are furnished. “Our expectation is that the parent gains income through employment within the first 30 days. There are some who choose education, but as long as they’re fulfilling a 20 hour a week requirement with us we don’t care if it’s working or going to school,” Massey-Flinn said. “We have families that have nothing when they come in and we make sure that they have everything that they need to set up household. Apartments come with small appliances, dishes, pots and pans. Everything that a family needs to come in and set up a household is there when they walk in the door,” Massey-Flinn said. “They get brand new linens and towels. There is a welcome basket that has basic cleaning supplies, and paper towels, toilet paper – pretty much everything they could need other than clothes and food,” Lacy said. Every participant is assigned a case manager when they move in, who will work with them the entire 2 years of their stay, help them develop a plan and manage their finances. Weekly life skills groups are also held every Monday night where speakers from the community come in and inform them of services they may not have been aware of and benefits that they qualify for. If parents work more than the 20 hours required a week, it is considered above and beyond and they qualify for the “Surpass” program. “Through Surpass they can earn points towards getting the self sufficiency items that are taxable, like toilet paper, paper towels, shampoo and conditioner – all of those needs that can pull away from their budget. It also gives them the opportunity to use that money to pay off past debts which is one of the major goals of the program,” Lacy said. For each hour that they go above the 20, they are awarded a point, or “H.M. Life Dollar”, which they can use to purchase the items. If something happens and an individual loses his or her job or their income decreases, HMLOS provides for their needs, whether it be food, diapers, gasoline or anything else along those lines. They also provide for the holidays. For birthdays they give toys and an outfit to the kids, and gift cards to the teens. The adults get a birthday card signed by the staff as well as something like a Bath and Body Works gift set (for the mothers). 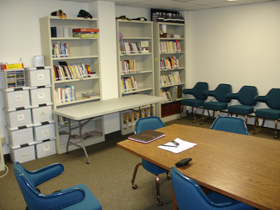 A library full of reading materials is also available to clients. 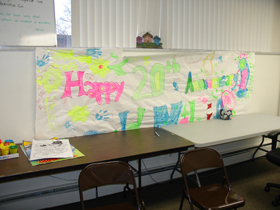 “We also have a really extensive youth services program,” Massey–Flinn said. In the summer it flourishes with camp opportunities. They also have a 15 passenger van which they use to pick up the kids, providing activities for them four days a week. An incentive program is used as a tool to get the kids to come to tutoring. They accumulate points every time that they attend and for actively participating while there. “They can use these points to purchase gift cards and go shopping at the mall to buy new shoes or clothes,” Massey-Flinn said. Since some of the kids have come for tutoring “Their grades have skyrocketed”, Lacy said. “Most of the people that come into the program really want to better themselves for their situation and their children,” Massey-Flinn said. One mother with three boys entered the program after living with different family members for years, bouncing from house to house. She didn’t have anywhere to go. “It was a very rough time in her life, but when she moved into H.M. Life she hit the ground running,” Lacy said. She worked more hours, went back to school to become an EMT and worked at clearing up all of her past debts. “She has really turned her life around,” Lacy said. Now she has moved into permanent housing and is paying rent, has established a savings account and is getting her drivers license. Transportation needs are a huge barrier for single parents – that is why HMLOS is doing something about it. “Imagine the time spent in transportation when you have to rely on the bus to get your kids to school then get yourself to work, and then repeat the process at the end of the day. We have people who are spending 3 and 4 hours a day just in transit,” Massey-Flinn said. They recently received a grant from the Women’s Endowment Fund to start a new program which they are calling “Mobile Moms”. “This grant is going to allow us to purchase used cars from auctions and repo sales. We hope to get enough community involvement to have vehicles donated to us and we will send them to a mechanic, have them upgraded and give them to families in need,” Massey-Flinn said. 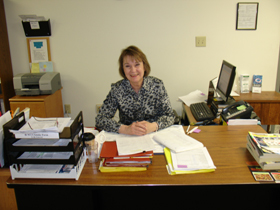 HMLOS staff welcomes anyone who would like to visit the agency. “We are always looking for volunteers,” Lacy said. They are in great need of volunteers for about an hour and a half on Monday nights for tutoring and to help with the babies. Volunteers are also needed on Wednesdays in Northfield. 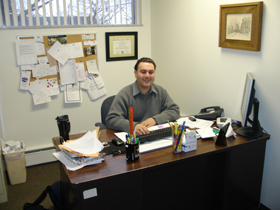 To find out more about this organization please visit www.hmhousing.org, or call (330) 376-5600.